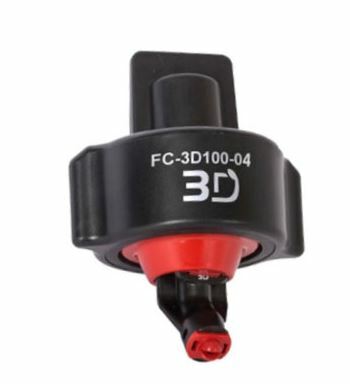 Available to order now, the Hypro Syngenta Defy 3D Nozzle Fascap version – which means it is supplied with Integral EF3-Euro fitting self aligning nozzle cap and seal. Delivery time is 3-7 days from order. Sold in sets of 50 x nozzles of single colour option, colours cannot be mixed and matched to make up the 50 nozzles. Sizes 015 Green, 02 Yellow, 025 Lilac, 03 Blue, 035 Brown Red, 04 Red 05 Brown, 06 Grey and 08 White available from our website here. This video shows more about the 3D Defy Nozzles. Increased efficiency means increased efficacy through more timely application of DEFY. This entry was posted in New Products and tagged Angled Nozzle Spraytip, EF3 Euro fitting nozzle cap, hypro defy 3d nozzle, hypro nozzles, hypro Syngenta 3D Defy fascap Nozzle, Low drift nozzles, post-emergence herbicide, pre-emergence herbicide nozzle on January 16, 2018 by agratech.